In the waning hours of a mid-November day, several piers of Fort Lauderdale&apos;s Las Olas City Marina are all abuzz in preparation for a fishing tournament that will begin the next day. All the finger slips have fish-rigged boats tied stern-to. Reels are being spooled, leaders carefully measured, and hooks tied. 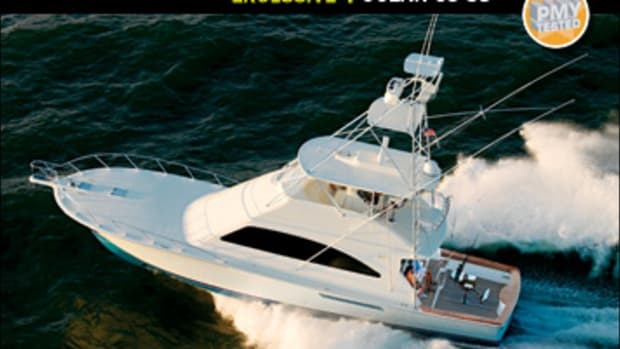 I have been invited to fish with Ocean Yachts&apos; president John Leek on opening day of the three-day 2002 Fort Lauderdale Billfish Tournament aboard his newest convertible, the 57 Super Sport. As Ocean captain Gene Hawn and mate Mike Scheimreif get our fishing gear together, and with Leek not due at the boat from his New Jersey-based flight for at least another hour, I take the opportunity to have a look around. 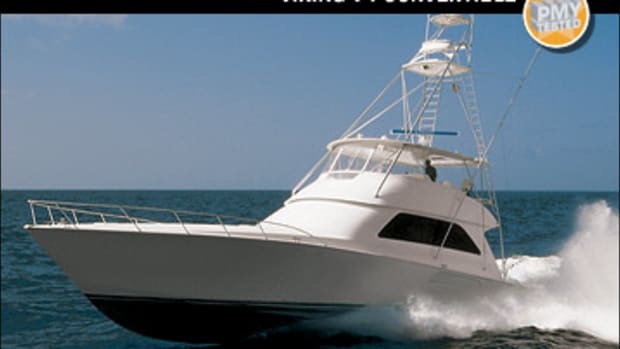 I&apos;ve reviewed many sportfishing boats and have found some to possess rather tight quarters in the engine room, so I start there. Because I&apos;m hands-on, I look for the kind of space I&apos;d be comfortable working in. So as I enter from the door from the cockpit, I take particular note of not only the headroom—I&apos;m 5&apos;9" and have room to spare while standing straight up—but also the access I have to the outboard side of the powerplants, which on this boat are a pair of 1,300-hp 12-cylinder MAN diesels. I also find it easy to get to the rest of the equipment, battery boxes, engine room wiring, genset, and other gear. Little wonder. This roominess is the first of two surprises courtesy of Dave Martin, the man who has designed all of Ocean&apos;s boats. "I was able to design the kind of space you found in the engine room after I removed the fuel tanks, usually located on the outboard side of the engines, and placed them elsewhere," Martin told me in a subsequent telephone conversation. By positioning one tank under the cockpit, another under the master stateroom, and a third beneath the steps leading down from the galley/dining area, and using data derived from model testing, Martin was also able to give the 57 a better attitude for meeting big water head-on. While the two-to-fours on my fishing day gave little indication of this, I did notice that when we moved up and down the coast several times in search of our next catch, it felt as if the ocean was dead-flat calm. Plus, Hawn told me that prior to my arrival, he had the boat out in 12-footers and was able to maintain a steady 27 knots in any direction. "What I wanted to do with this design was to obtain a much smoother ride without losing the speed and efficiency of my previous designs," says Martin. "After all, if our guys want to go to sleep on their way out to the canyons, they should be able to get a few hours in and not know they&apos;ve arrived until the captain throttles down and has his lines out." To do this, he gave the 57 a new bottom by first removing the inboard pair of the four lifting strakes found on previous designs. He placed the remaining pair farther apart at the bow than at the stern and down-angled them at 33 degrees. Why? "There is a suction in the bottom of planing hulls that occurs between two-thirds and three-quarters of the waterline length aft of the bow," Martin explains. "The down-angle lifting strakes feed water to the suction area, reducing resistance and feeding water to the props." This feeding of water to the props also improves efficiency at lower cruising speeds due to reduced slippage. 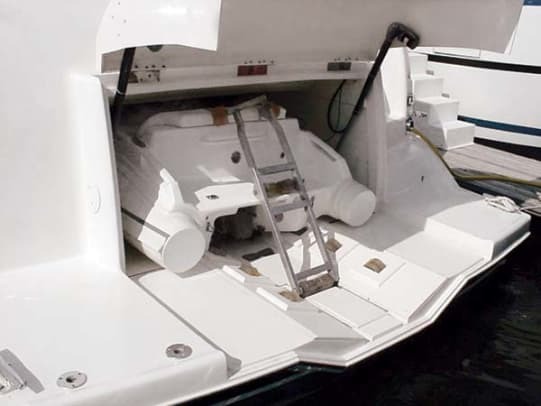 "The removal of the inboard lift strake also moves the center of lift outboard and increases high-speed stability," he adds. Martin also told me that most naval architecture textbooks on planing hulls teach that deadrise angle should be about the same amidships as at the stern. Not so on the 57, since at 25 percent of her waterline length—that being 51&apos;4"—her deadrise is 38 degrees; at amidships it&apos;s 21 degrees; and at the stern, 14 degrees. "We were always sharp forward, and now we&apos;re even sharper," he says. 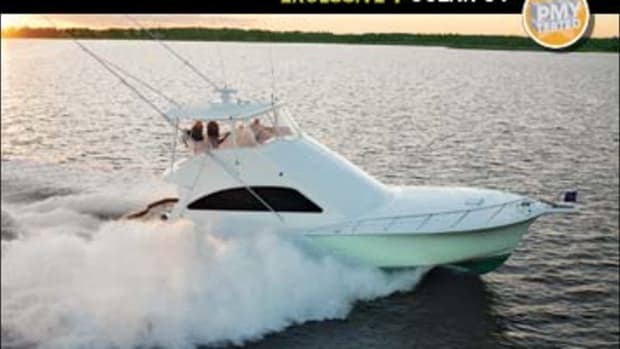 The design seems to have worked, as during my sea trial, I posted the following performance numbers: a WOT speed of 43.1 mph (37.5 knots)—pretty good for 1,300-hp diesels and a 66,269-pound dry weight. I also liked her 38.6-mph cruise speed, which, combined with her 1,047-gallon tankage, gives her a range of 342 NM. When Leek finally arrives, we promptly settle into a discussion about his new boat. He tells me the design began with input from a group of 56 Convertible owners along with technical data compiled on the 62- and 70-foot models. "Basically, we wanted this boat to run a little flatter and be able to stick its nose into the sea a little more and still maintain a decent cruising speed," he says. The result was the new bottom design. Leek now gives me the cook&apos;s tour of the 57. While the interior and exterior profile remain basically unchanged from the 56, Leek shows me some of the subtle updates he incorporated into this boat. The flying bridge has an additional cooler, the helm console is a little wider for easier electronics installation, and there&apos;s lots of seating forward with stowage areas beneath. 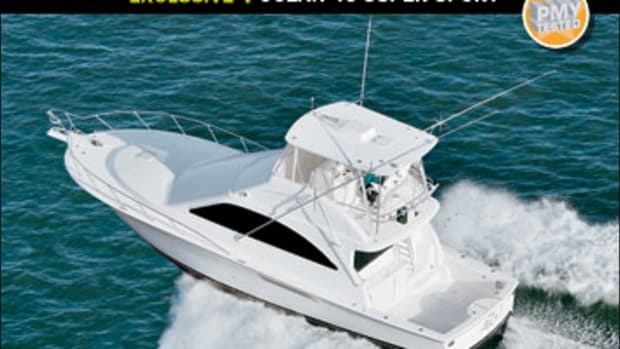 The hardtop is standard, with optional flush-mounted teaser reels above the helm. The interior cabinets feature standard inlaid wood trim. Ocean also offers several custom decor packages made up of a number of color schemes and fabric options, and light maple can be ordered in place of the standard teak interior. Our next stop is the forepeak stateroom, where I stow my gear, as it was to be my quarters for my overnight stay. He then shows me the double berth just aft and to port of the forepeak, as well as the amidships master. Both my quarters and the master have en suite heads, while the double-berth quarters had access to the day head just opposite it. 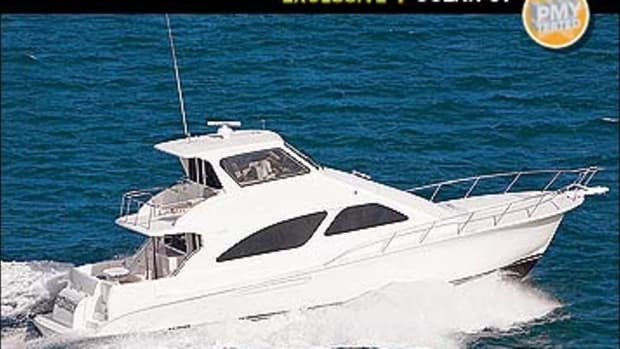 I find all the accommodations comfortable, well appointed, and roomy, with more than adequate stowage supplied by closets and drawer space enough for an extended weekend fishing trip or an island-hopping cruise. As I explore this area, I note that Ocean has used every available opening, no matter how small, for stowage—many that ordinarily would have been dead space. In addition, there&apos;s a washer and dryer in a closet just aft of the day head. As with other Ocean Yachts, the 57 also possesses a comfortable and well-planned main deck. 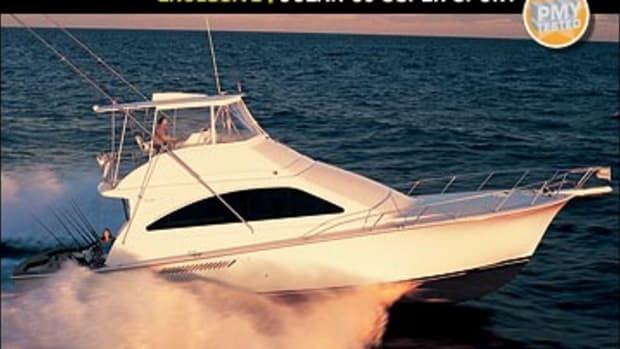 The saloon has an L-shape couch to port—there is stowage beneath it as well as in the corner table with its lift-up top—and a 27-inch flat-screen TV and DVD player in the entertainment center to starboard. The galley is forward and to port, and a six-person dining area lies opposite it. I note large Corian countertops, a microwave/convection oven, a three-burner Force 10 stovetop, a four-drawer under-counter refrigerator/freezer, trash compactor, dishwasher, an instant hot-water faucet, and plenty of cabinet and drawer space. It&apos;s easy to envision anything from a light snack to a sit-down dinner for six after a long day&apos;s cruise or boating several trophy fish. 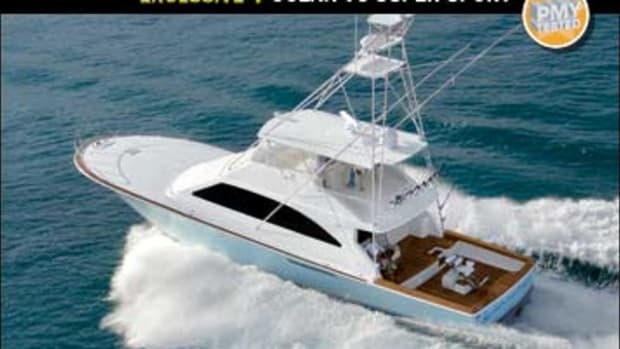 And on the subject of fishing, the 57&apos;s business end is her 144-square-foot cockpit, which, as you&apos;d expect, has all the requisite standard equipment. 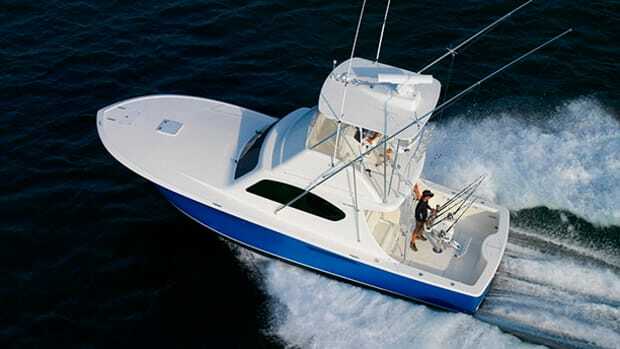 There are port and starboard rod stowage cabinets beneath the gunwales, a transom door, a livewell, four in-sole compartments consisting of two fishboxes (one with an optional Eskimo shaved-ice maker) and two dunnage spaces, and a bait-prep station. I prefer the optional teak coaming boards on this boat, as they add a nice touch. However, if you don&apos;t like the upkeep, you may want to stay with the standard fiberglass finish. The Pompanette fighting chair is also an option. By the time Leek and I finish our conversation over dinner, it&apos;s time to turn in. Dawn breaks cloudy the next morning as we take on live bait and wait for the Bimini start. "Let&apos;s go fishing," crackles a voice on the radio. Hawn quickly locates a weed line and some flying fish followed by several small tuna. Hopefully something bigger is chasing them. Leek draws the first two fish, both mahi-mahi, which are quickly boated. I get the third, another mahi-mahi. Then we see no more knockdowns for the next few hours until Leek hooks up again with a sail. With some nice maneuvering by Hawn and some good leader work by Scheimreif, we release our catch. Our four fish will have to do for the day. The call for lines-up comes, and we head for the barn. 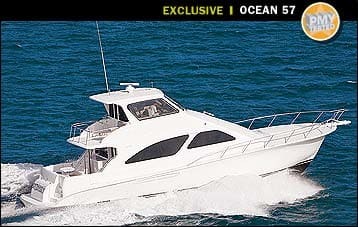 The Ocean 57 is an impressive addition to the company&apos;s fleet. 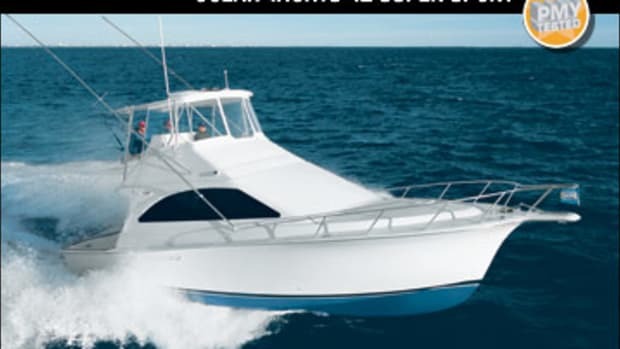 And with Martin&apos;s new running bottom, this boat should please both fishermen and cruisers alike. "I&apos;m always trying to do things better," he says. Looks like he has—again. This article originally appeared in the February 2003 issue of Power & Motoryacht magazine.